Before the Tumulus period (258-646), Japan was divided into domains, their mixed populations including immigrants from Korea and the East Asian mainland. These domains were gradually federated into a unified state, marking a period of an emergent national "Japanese" style. Enormous tombs--kofun, or "tumulus"--were constructed for the elite. These tombs were covered with earth, forming burial mounds often in the shape of keyholes, and surrounded by moats. 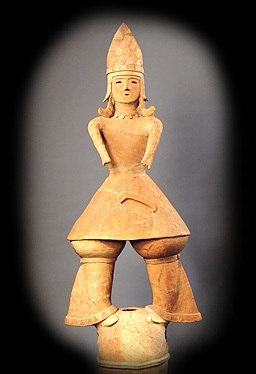 Haniwa figures such as this one lined the contours of the mound and the entrance to the tomb, and were positioned frontally, facing outward. The haniwa functioned not only as attendants to the departed, guardians of his tomb, and emblems of his status, but also as national symbols for a unified country, placed above ground for all the living to see.